Growing plants from seeds is not only easy to do, but it is also one of the cheapest ways to fill your garden with abundance. Some people may think only of growing vegetables from seed, but flower seeds are just as easy to plant. As a bonus, you'll have a greater choice of variety and color if you are willing to start your own rather than just buy what's already been grown in flats for quick sale at the start of the season. Perennial flowers may not bloom their first year, but if you have the patience to wait, you can fill your garden for a fraction of the cost of buying plants. Annual flowers will bloom right on schedule. Many of them will even seed themselves, so you will have to plant them only once to receive the benefit of their years of blooming. If you've been dreaming of nonstop color, pick up some seed packets and get started. 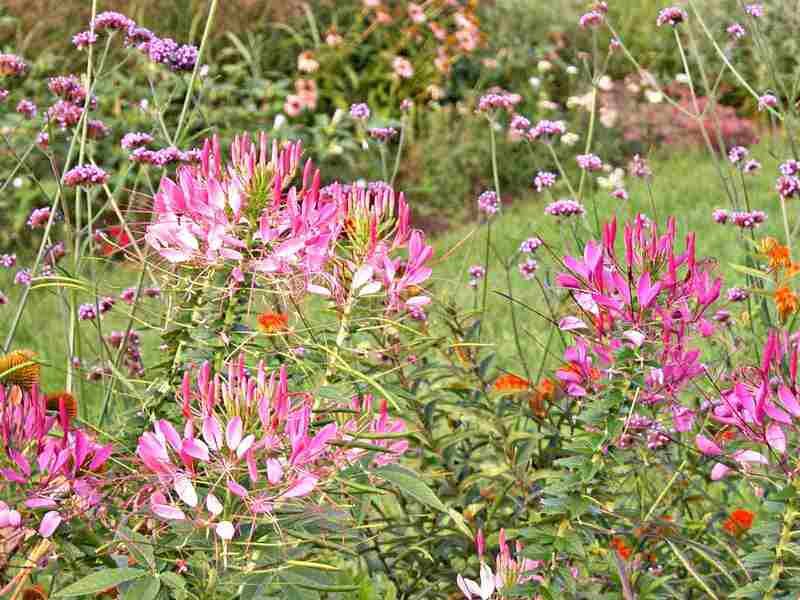 Annual flowers are the backbone of billowy cottage gardens. Many annuals will even seed themselves. All you have to do is leave the flowers on the plants at the end of the season. They will drop seed, and almost magically, the seeds will weave themselves throughout the garden. OK, it's not really magic, and sometimes you will get too many seedlings in one spot, to the point of them becoming a nuisance, but small seedlings are easy to pull or transplant. Annual flowers tend to grow quickly, and even those you direct sow outdoors in the spring will flower at their usual bloom time or very soon afterward. Just about any of the annuals that self-sow are good candidates for starting from seed, either indoors or direct sown. Most perennial plants don't bloom until their second year. They spend their first season growing a strong root system and lots of leaves for photosynthesis. Sometimes you can get around this by starting your perennial seeds in the fall and fooling the plants into thinking the following spring is year two. Sometimes you just have to be patient. After your perennial flowers are established, they will not only begin blooming, but they will also grow larger every year. In a few years, you will be able to make even more plants by dividing the ones you have. What's more economical than free plants? Winter sowing involves starting seed outdoors, while the temperatures are still frigid. Not all seeds can survive freezing temperatures, but there are some that absolutely need the freezing and thawing action to break dormancy or to crack their hard coverings. Seeds with really tough or thick coverings can take forever to germinate. Scarification (nicking them or rubbing with sandpaper) can give them a jump start. Stratification is a technique used for seeds that germinate better after a period in cold, moist conditions, simulating winter. People in zones that don't have a long enough or cold enough winter for a desired plant would practice stratification—and any gardener can benefit from stratification for some delicate perennials, such as delphinium and violets, which will just germinate more seeds if they're put through the process. The technique involves placing seeds into a baggie with peat moss, sand, wet paper towels, or a growing medium to keep them moist, and placing the baggie in the fridge. Placing a cold frame in a cool garage can also work, depending on how cold it gets inside of it. This process is done to prepare seeds that are direct-sown into the garden. You'll need to know your last frost date, as your seed packets will note which can be successfully started indoors—not all seeds transplant well—and the time frame. For supplies, you don't have to have the latest and greatest, as long as you have some potting mix (which doesn't necessarily include soil), something to plant the seeds in, and a way to keep them moist (not sopping wet). Your supplies can be anything from paper cups or paper egg cartons and clear plastic bags to tiny pots, peat pots, or seed-starting trays with a clear lid. You don't have to have a mini greenhouses with grow lights and an automatic watering system to be successful. Some seeds may require hardening off (exposing to cool temperatures) before planting outside, but this will be noted on the seed packet if required. There's a certain romantic quality about a field of wildflowers. Many gardeners are drawn to them for their natural look. If you plan to start one from seed, it is not as simple as picking up one pack of wildflower seeds, as a wildflower garden is an ecosystem that includes perennial native plants, grasses, and self-sowing annual flowers. They require a lot of diligence to become established and regular maintenance and renewal to keep them looking good and prevent them from becoming weedy. Prepackaged wildflower seed mixes can start off your garden area. The label will list how wide of an area the package will cover, and some larger bags may even come with fertilizer and mulch mixed in with the tiny seeds. You'll need to keep your eye on the wildflower area for balance between species (overseeding the species you want, annually, can help). Any perennials in the mix may not sprout the first year. Weeds will want to encroach while the area becomes established too, so you'll need diligence in your efforts to pull those. Just remember, the results of your efforts will be well worth the work to establish the wildflower garden. A long-blooming garden has another perk. At the end of the season, you can collect seeds from your plants to sow the following year. You just have to wait until the seeds or seed heads ripen. Then harvest them, such as by tapping the seed heads and having the seeds fall from them into a brown bag or by snipping off the seed heads whole. Ensure they're dry before putting them in labeled envelopes to store for the following year. Remember that hybrid plants will not grow the same as their parent plants (a pink flower may get you red and white plants the next year, for example), but heirloom, self-pollinated plants will grow true (just like their parents). If you already have enough of your existing plants and want something different, either swap seeds or start the seedlings next spring anyway and swap them with friends. Look for seed swaps in your community, at public gardens, and online, or start one of your own.